I apologize for the poor resolution of this picture. A flaw in the uploading process, I think. This picture of Amos and Edith Wood is undated. I think it was taken on the occasion of their 50th wedding anniversary in January, 1894. Edith died in September, 1900. Amos meets my definition of Elk Rapid’s earliest white settler in the sense that he settled here and stayed here. Many others lived here a while and moved elsewhere, frequently to Traverse City. Amos was born near Brockville, Ontario, on the St. Lawrence River in 1823. We know of two brothers: John B., a grocer, remained in New York and cared for his father, Isaiah, until Isaiah’s death in 1898 at nearly 104. Richard Wood arrived in Whitewater Twp. prior to the Civil War, married Samantha, a daughter of Josiah Curtis and, after her death, married the widow of John Maitland. A number of people in the area still remember Richard’s son, Curtis, who ran a produce market. A third brother may have been Enoch Wood. I have found no documentary proof yet but Enoch, who was here by the spring of 1853, appears on the 1860 Census in Whitewater Twp. just South of Amos’ farm and, roughly, between those of Amos and Richard. Further, Enoch married Samantha’s sister, Matilda. At some point, Isaiah and his family moved across the river to Morristown, NY. Amos married Edith Fraser or Frazer or Frazier, depending on the source, in 1844 on Wells Island, near Kingston, Ontario. Edith was the grand-daughter of a Revolutionary War veteran. The timetable of Amos’ early life as set forth in "Biographical History of Northern Michigan" is difficult. Apparently he came to Battle Creek at some point. The 1850 census confirms that he and his family was living at or near Lowell. Somehow, he came to meet Abram Wadsworth, who persuaded him to come to Elk Rapids. In the fall of 1851, Abram, Amos and a few others walked from Grand Rapids to Elk Rapids, following section lines and occasional trails. Who were the others? Only one is mentioned in the three principal sources for this period, Alex McVicar. My guess is that the others were associated with Wadsworth in some way and stayed at Traverse City, rather than continuing to Elk Rapids. 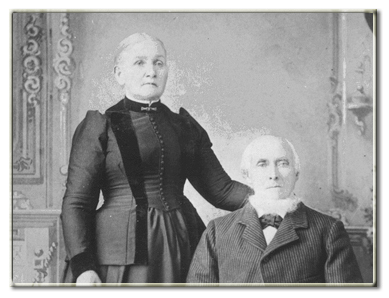 Lydia McLaughlin said that when they moved from Northport to Elk Rapids in November, 1851, only two families were there, those of Amos Wood and Alex McVicar. Some sources briefly mention a Mormon family named Barnes that soon left. During the early period in Elk Rapids, Amos worked for Abram as an axe man when Abram was engaged in re-running survey lines that have been poorly done in the 1840's. He and Alex McVicar also worked on boats plying between Chicago and Elk Rapids. According to Amos, in papers relating to his Civil War service, he had lost his marriage certificate and other papers in a ship wreck. On Lake Michigan, perhaps??? Amos purchased a lot in the settlement from Abram in 1853. Edith’s father, William Day Fraser, arrived on the scene during this era, going to Duncan (now a part of Cheboygan) in 1854 to file for a homestead on the land on Elk Lake just north of the county line that later became the Wood farm. A number of sources mention an extremely severe winter during this period when the little settlement ran out of food, being saved when a boat appeared in the harbor with provisions just as the ice went out. Only a brief story in the Elk Rapids Progress reveals that two men walked to Kalamazoo and took a train from there to Chicago to secure the provisions. In 1864, at the age of 42, Amos went to Detroit and enlisted in the army. Why would a man of his age leave his family behind in the wilderness? One source says that two children were born and died during this period. In 1864, the government needed more and more men for the War and began offering enlistment bonuses. Perhaps this was a motive. One of his daughters married Jonas Horton, son of Samuel Horton, of Horton’s Bay. In 1881, Amos had Jonas build a new house on the farm on Elk Lake Road. At some point, Amos turned operation of the farm over to his son, Chester. Eventually, Amos went to live with his son, William, on a farm south of Kewadin. He was well known in his late years for his vigor, digging potatoes in his nineties and doing hand stands for the amusement of bystanders. Percy Noble remarks on the centenarian walking from William’s farm to Elk Rapids. Amos’ several children included: Rosella, who after an unfortunate first marriage to a swindler, married John Ferguson; William, who married Rhoda Hawley; Anna Melissa, who married Hiram O’dell; Elida, who married Julia Filer and, after her death, two others; George Enoch, who married Charlotte Maria Beebe, and after her death, Sarah Jane O’Brien; Ernest W., a Methodist minister who married Charlotte Way and, after her death, Mary Todd Allen. There may have been a wife between Charlotte and Mary. Ida Elnora married Jonas Horton and, after his death, Richard Ryan. Orland died at 18, overcome by gas while digging a water well for Josiah Curtis. Amos mentions in his Civil War papers a daughter, Fanny, born in 1863. We have no other data about her. Chester married Effie J. Vansaw and died at Kewadin in 1915 of cancer. Several of these families were quite large. The list of grandchildren is incomplete at 49!